Protects against both burning UVB and ageing UVA rays. 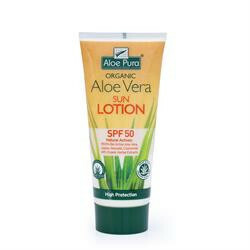 This paraben-free Bio Active lotion, moisturises, softens and helps hydrate dry, sensitive skin. 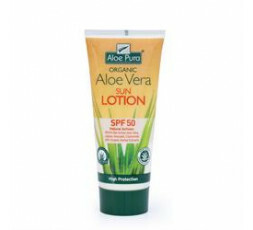 Optima Aloe Vera Lotion is produced using 99.9% pure Aloe gel, capturing the maximum nutritional activity of the Aloe Barbadensis plant. Organic Aloe Barbadensis (99% Bio Active Aloe Vera Inner Gel)*, Caprylic/Capric Triglyceride, Glycerin, Cetearyl Alcohol, Cera Alba, lauryl Glucoside, Polyglyceryl - 2 Dipolyhydroxystearate, Aqua, Butyrosperumum Parkii (shea butter)*, runus Dulcis, Tocopheryl Acetate, Xantham Gum, Hyaluronic Acid, Glycyrrhetinic Acid, Allantoin, Tocopherol, Ascobil Palmitate, Lecithin, Citric Acid, Citrus Limonum (lemon)*, Citrus Dulcis (ornage)*, Lavendula Hybrida (Lavender)*, Artemisia Vulgaris (Common Mugwort)*, Pogostemon Cablin (patchouli)*, Phenoxyethanol, Potassium Sorbate, Benzoic Acid.